As an Anglican I wear vestments to lead worship. In England I robed in a vestry, in the United States I robe in a sacristy. I prefer the term “vestry” but I can’t use it back in the USA without causing confusion. A Vestry is PEOPLE, to misquote Robert Thorn. When you have robed in as many vestries (forgive me) as I have, you begin to notice particular prayer plaques or cards set up by priests that have come before you to help you prepare. I think I have found what I would like on a card to read as I leave the vestry for my prayer desk and the pulpit. 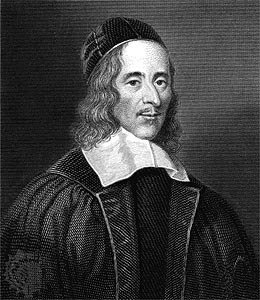 It is George Herbert’s poem Aaron written around 1633. The poem always catches me in how with such few words Herbert reminds me what Holy Scripture teaches: I am as a sinner who struggles in old Adam’s garment, and who I am new in Jesus Christ – it is in his righteous garment that I am now clothed!